Some muffins are really just cupcakes pretending to be good for you. These are not those muffins. As a mom of four small kids, healthy muffins are my secret weapon for packing as many nutritious ingredients into my rascals as possible. All those fruits and veggies? That's the magic. 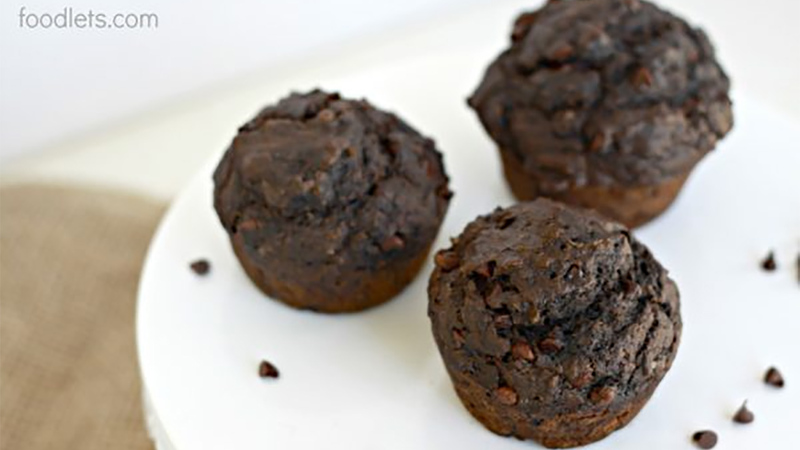 This recipe uses the same technique to get 5 kinds of fruit & vegetable puree as our non-chocolate version: Magical Muffins. Just put a combination of apples, bananas, zucchini, spinach, carrots or sweet potatoes into a pan (or the microwave) with a little water. Heat until softened. Buzz with a food processor. Use what you need now and save the rest for another batch another time. That's the trickiest part and it takes about 10 minutes. Then it's mixing in a bowl and baking in the oven. Use ANY combination of these ingredients to make a puree: Sweet potato, baby spinach, zucchini, banana, apples. Put fruit & vegetables in a pan or microwave safe bowl and add enough water to cover. Cook until soft (4-5 minutes). Puree, along with the cooking water. Use 1 cup for these muffins and freeze the rest for another batch OR make smoothies in the morning--just add another banana plus some coconut water and a handful of frozen fruit. Yum! Combine oil, egg and sugar in a large mixing bowl. Add 1 cup of pureed vegetable mixture and stir. Sift flour, baking soda, salt and cocoa powder over top of liquid ingredients. Use an ice cream scoop to get uniform scoops into a greased muffin pan. George (5) "Good. I'm eating this whole pan." Estelle (6) "I think very banana-y but very good." Phoebe (8) "It's very yummy like a brownie and I enjoy it very much." Violet (3) "Mmm. It's good! Who made this?"